When I am asked if I’m an autograph collector, my answer is Yes and No. When I am asked what my hobby is, I always answer that I collect Hitchcock and his films related items. Elizabeth Taylor, the violet-eyed femme fatale whose smoldering talent and eight marriages made her a legend of Hollywood's golden era, died on March 23, 2011. She was 79. The two-time Oscar winner suffered from congestive heart failure and had been hospitalized in Los Angeles since February. 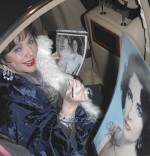 If you are attempting to obtain an authentic Elizabeth Taylor signature...be aware of secretarial signatures, pre-printed signatures, and autopen signatures. By the end of the 1940's, over nine hundred letters arrived weekly at the studio for the young ingénue, so Taylor had some help from the studio secretaries in keeping up. Pre-printed autographs are photographs that have been signed once and then mass-produced. These were often sent out by MGM to autograph collectors of the 1940s and 1950s. Also be aware of forgeries...look at authentic examples and buy only from those dealers you trust. Forget the third-party authenticated items...I've seen too many bad examples deemed authentic and vice-versa. Find a good signature study and/or authentic examples to compare with. Taylor was always a gracious signer in person, trying her best to appease the mobs of fans that are ever present. This may be because Taylor herself loved to collect autographs.